The European earwig is chiefly a garden pest but occasionally attacks tree fruits. 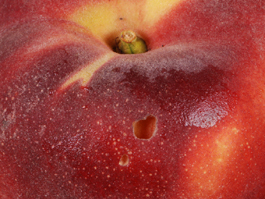 Adults and nymphs can damage pome and stone fruits. The name earwig comes from an old, unfounded superstition that the pest invades the ears of humans. Earwigs attack a wide range of plants including vegetables, flowers, tree fruits, berries, ornamental trees and shrubs. At times, they can be scavengers or predators, feeding on decaying vegetation or insects such as aphids. The egg is small, oval and pearly white. The young earwig passes through four instars. 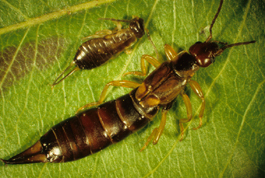 The immature earwig starts out creamy white but the cuticle soon hardens and darkens in color. It looks like the adult, except it is wingless. The full-grown earwig is brownish black, about 3/4 inch (2 cm) long and has a pair of forceps-like appendages at the rear. The male has curved forceps and the female’s are straight. It has short, leathery forewings under which are tucked a rear pair of wings that look like tiny fans when open, but it rarely flies. Some species of earwigs have scent glands on their abdomen that release a foul smelling odor, which is probably for defense. Adults go into the soil in the fall to form earthen cells in which they live in pairs. The females lay eggs in clusters of 20 to 50 during the fall and spring. The cells containing the eggs are in the top 2 to 3 inches of soil. In the spring, the females open the cells and the nymphs emerge. 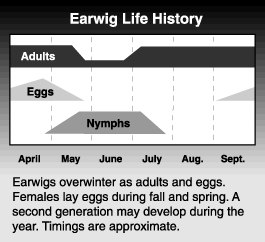 Earwigs are semisocial and will look after their young in the early stages. After leaving the ground, they hide in deep crevices or under loose bark on trees. The nymphs mature in midsummer, and a partial second generation may develop some years. 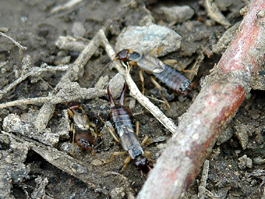 As earwigs rarely fly, infestations in orchards spread slowly. Earwigs damage both leaves and fruit. Leaf damage is unsightly but of little concern on mature trees. On young seedlings, however, the earwig’s feeding on shoot tips can stunt tree growth. 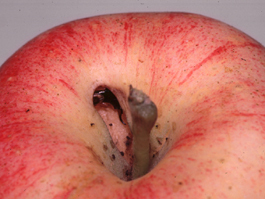 Damage on tree fruit crops is usually confined to shallow, irregularly shaped feeding areas on the surface , but occasionally an earwig will bore through and feed on the flesh near the pit of stone fruits. Earwigs will get into any area damaged by other pests, such as birds and caterpillars. The European earwig can be considered an important predator of some fruit pests, with aphids, pear psylla, mites and insect eggs (including those of codling moth) forming a significant part of the diet. Artifical nesting sites are used in European orchards to increase the abundance of the European earwig. If damage is unacceptable, apply a pesticide around bases of trees and on trunks during the summer, observing the appropriate pre-harvest interval. Do not apply to blooming cover crops because of the hazard to bees. If you provide a hiding place such as corrugated cardboard or deep pile carpet (with the pile toward the inside) on the tree trunks, the earwigs may gather there, allowing you to treat just a limited area. This can also be used for monitoring. Large numbers may be trapped in boxes that are filled with straw or newspapers and inverted on the ground. Earwigs are nocturnal and feed at night. During the day they will hide under leaves, inside leaves rolled by leafrollers, in refuse on the ground, under loose bark or in crevices on the tree trunks. When disturbed they move about quickly looking for new hiding places. A flat board laid on bare ground can be used to monitor the presence of earwigs.